Bluetooth barcode scanners provide an easy and high-tech means of wirelessly scanning barcodes (Source). They integrate with a huge number of different operating systems and programs- making them an essential and general-purpose strategy for high volume, mobile data collection (Source). The way they work, is that the barcode scanner reads the barcode, either inputs it directly into a text file, spreadsheet or database or stores it into its internal memory for a later dump of its barcode history (Source). The barcode is translated into a typed text format- deciphering it into a numerical equivalent. These barcodes can the be correlated to a specific product using different inventory software solutions (Source). The Teemi Bluetooth barcode scanner is our top pick- it connects wirelessly or via USB, uses a rechargeable 1500mAh lithium ion battery, is equipped to store up to 2600 barcodes and is comparable with. Users are generally pretty pleased with this wireless barcode scanner, saying that it is especially light, easily recognizes barcodes, conveniently includes wireless and wired options. It works across a large range of different platforms (Google Android 4.0 Above, Microsoft Windows XP/7/8/10, Mobile6/Wince, Mac OS-X, Apple iOS 9), and holds a charge for a particular long time. In addition, it fits into the hand pretty well, is competitively priced compared to other scanner options on the market, and one user said that it lasted over 10 days without requiring a recharge. On the downside, one user complained that parenting is multi-step, which can slow things down a bit, and that he had some difficulties with keyboard entry on his Android device once it was paired with this Bluetooth barcode scanner. It ships with the wireless laser scanner itself, one Bluetooth adapter, one power adapter, one USB cable and an instruction manual. That said, let's take a look at five of the best-selling Bluetooth barcode scanners on the market today and see how they compare. The 7” x 4.6” x 1.4”, 9.9 oz Inateck BCST-10 Bluetooth Barcode Scanner is a very good option that has a 256 KB internal memory that can store more than 2600 data strings. Its users love that it has a high resolution accuracy (minimum of 3 mil), but some users also note that it doesn’t feel very durable. Its integrated 1500 mAH Li-Ion battery has a standby of more than half a year if fully charged and can scan continuously for more than one week. In addition to Bluetooth connectivity, USB 2.0 is also possible with a cable, which is included with the unit. It supports several languages, and can also read USPS and FedEx barcodes. It has a signal range of up to 33 ft. This barcode scanner is a solid option if you are looking for an inexpensive bluetooth scanner. Users of the Inateck BCST-10 bluetooth scanner generally agree that it is a solid performer, and operates well both in bluetooth and wired modes, although there was one user who felt that it works better when connected by USB cable. They are satisfied with its easy setup and accurate scanning, as well as its light weight. Users also like the comfortable grip, although they believe that non-slip pads could have improved it. They also found the instruction manual difficult to understand. The 8” x 4.1” x 3.2”, 11.2 oz, TaoTronics® Bluetooth Wireless Barcode Scanner is a good option that has 2 scan modes: key the trigger to begin scanning or switch to automatic mode for quick scanning without pressing any buttons. Its users like that it is easy to use, but also note that it takes too long to start up. It has a 33 ft signal range and has an inventory mode that allows storage of thousands of barcodes in its 64 KB internal memory. Its 750 mAh rechargeable battery has a 30 hour working time and 2.5 hour charging time. Made of ABS plastic, it is durable and has been tested to withstand 1.5 meter drops. This wireless scanner is a fair option if you are looking for a cheap Bluetooth barcode scanner. People who use this wireless barcode scanner are pleased with how easy this product is to use, as well as its good bluetooth connectivity that forms stable pairs with a computer or other device. However, one user did not like that it is set to automatically sleep after 20 seconds, and recommended getting the downloadable PDF file which contains the instructions for adjusting sleep timer. A user who owned a retail shop was unhappy that it takes too long to start up and seems to randomly fail to scan some barcodes, and it therefore may not be the best choice for medium to large business purposes. The 7.9” x 3.3” x 5.2”, 13.6 oz 2-in-1 Bluetooth Barcode Scanner is an excellent option that has a robust design and comes with a Bluetooth dongle and power adapter. Its users love its well-made quality, but also note that it does not work with some PC operating systems. It has an integrated 1500mAh rechargeable Li-Ion battery, and can be connected either by USB cable or Bluetooth wireless connection. With a built-in memory of 256 KB, it can store 2600 barcodes. It is robust enough to withstand a free fall height of 1.5 m. It supports several barcode types, including USPS and FedEx codes. 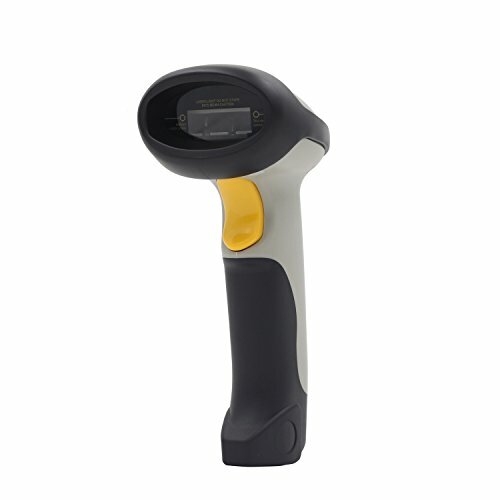 It has a resolution of 3 mil and a signal range of 10 m. This barcode scanner is a great option if you are looking for a laser scanner with very good functionality at an affordable price. Most people who have used this bluetooth barcode scanner say that it is one of the best scanners around for its price range. They love that it comes not only with a USB cable, but also a Bluetooth adapter/dongle as well as its own power adapter, although one user did not like that the Bluetooth dongle was way too big. Its long-lasting battery is another good point for many users. The chief negative comment on this product is that setting up may be a bit of a challenge for first time users and also that the user’s manual was written in imperfect English. The 5.1” x 1.6” x 1.4”, 13.4 oz Socket Mobile 7Ci CX2870-1409 Bluetooth Barcode Scanner is a well-designed option that is available in multiple colors to enhance corporate branding in retail or customer service enable personalization. Its users like that it is wearable and comes with a lanyard/belt clip for convenient access, but also note that since it is an image scanner, it works slower than laser scanners. Its includes 2 AAA rechargeable batteries and a USB charger kit. A fully charged unit will provide 19 hours of scanning work. It has a resolution of 5 mil and Bluetooth connection range of 30 ft. It is an Apple certified product but works with a wide range of other devices and operating systems. The unit has a button that can be pressed to quickly open and close Apple iOS on-screen keyboard. A software is also included that allows for greater functionality and scanner configuration for more advanced users. This handy device is an excellent option if you are looking for a well-designed Bluetooth barcode scanner. Most users of this bluetooth scanner are quite satisfied with its performance. One user liked that it is powered by easy to find AAA batteries. Its very small size and wearability also contribute to the generally positive feedback from users. However, some users also note that it is slower than laser scanners and pairing with certain Windows operating systems took very long. The 7.9” x 4.3” x 3.3”, 9.6 oz Shonco Bluetooth Barcode Scanner is a very good option that comes with its own USB 3.0 dongle which is very small and unobtrusive. Its users love that it is very well-made and easy to install, but also note that the directions in the manual are not the easiest to understand. Its built in 1500mAh rechargeable Li-ion battery, including the power adapter, provides a very large number of scans and ultra-long battery life. The Inventory Mode allows you to count the numbers of what you have scanned and upload these automatically to your device. It supports USPS and FedEx barcodes and has a resolution of 3 mil. This barcode scanner is a solid option if you are looking for a Bluetooth scanner that works well and does not hurt the wallet. Users of this product are quite happy with its performance and ease of use and setup. One user was also pleased that the size is just right and fits great in her hand. The very long battery life also impressed everyone. One negative comment on the product is that it seems to work well in some apps but not others. These wireless Bluetooth barcode scanners are highly convenient and dynamic data collection devices. They even have some unexpected uses. 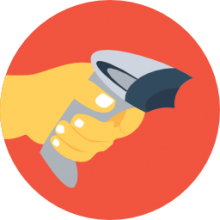 One user describes using his Inateck Bluetooth barcode scanner to inventory a personal library of books. In order to catalog his vast collection, he bought some book-collector software that would convert the ISBN codes into a full book description with cover jacket imagery. However, since he found the iPhone barcode scanner app he was using inefficient and difficult to use, he was pleased to find wireless barcode scanners available for purchase online at an affordable price. He began processing his library, using the barcode scanner in an off-line mode, scanning his books one at a time, and storing thousands of ISBN codes. Once he collected all of these different codes, he connected his barcode scanner via the USB cable to his personal computer, dumped them into a word document and then used his cataloging software to translate the codes into book titles and book jacket images. This is a representative case study of the utility of these Bluetooth barcode scanners- enabling this particular user to process a ton of data quickly and in a mobile fashion. Indeed, Bluetooth scanning has many business applications as well- whether you own a grocery store or other type of retail business, Bluetooth scanning is great in warehouses and for receiving shipments when you need a fast and quick way to conveniently scan inventory. As well, most of the units that we examined can scan and perform long-distance capture from up to 30 feet away, with the scanner wirelessly transmitting data back to a receiver, or storing it internally in an inventory mode. Rechargeable batteries also are another convenient feature- many of the Bluetooth barcode scanners can last up to 30 hours at a time from a single, full charge. Scanner channel settings help to enable private communication, preventing interference from other scanners that are being used in the area. Be sure to check the barcode compatibility prior to purchase- most of the Bluetooth barcode scanners we examine support the traditional range of barcode types: UPC-A,EAN-13, EAN-8, ISBN/ISSN, UCC/EAN128, CODE 39, CODEBAR, INT 25, IND 25, CODE 128, CODE 93, UPC-E, CODE 11, MSI/PLESSEY. But it's best to doublecheck this prior to purchase just to be on the safe side. All that said, if you are in the market for one of these wireless barcode scanners, read our reviews, and also check in on the individual product pages to read customer feedback- this is a great way to get a sense of what other users are saying about devices they purchased.